BANGI, 12 Dec 2013 – Residential College Tun Syed Nasir (KTSN) took top prize in the parade competition during the closing ceremony of the SUKEM 2013, held at the University Kebangsaan Malaysia (UKM) Stadium. KTSN collected 580 points to beat out second place, Keris Mas College (KKM), third place AminudinBaki College (KAB) and fourth place Ibrahim Yaakob College (KIY), to bring home the coveted Best Parade award. KTSN received RM 1000 and a trophy for their efforts. While KKM received RM 800, KAB received RM 400 and KIY RM 300, respectively. 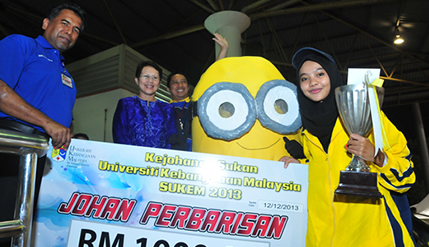 The Best Parade award was the highlight of this annual SUKEM event at the newly-refurbished UKM Stadium which was alight with colour, dancing, mascots and music. KTSN’s parade performance was simple yet structured and flawless. Part of their brilliant success was their creativity in having a “Minion” as their mascot. The “Minion” is a character from the Universal Pictures Animated Film “Despicable Me” franchise. Vice-Chancellor Prof. Tan Sri Dato’ Seri Dr.Sharifah Hapsah Syed Hasan Shahabudin and Prof. Ir. Dr.Othamn A. Karim Deputy Vice Chancellor of the Students and Alumni, were in attendance at the closing ceremony. Tan Sri Dr.Sharifah commended the students for their effort, creativity and passion in making the parade lively and full of humour. She also applauded the effort by the KIY Football team, which had been beaten in the final by KAB with a 3 – 1 score line. She added that even though KIY was a small college and sometimes did not have enough students to take part in sporting events, they defied the odds to make it to the final. Nevertheless, she noted that KAB had six of their current students who are national team players from the Harimau Muda Squad. “They play for Malaysia, I don’t think it’s fair if you lump them all in one team. No, next time we separate them, give the rest of the colleges a chance at winning football for once,” Tan Sri Dr.Sharifahsaid jokingly. Also present was Director of the UKM Sports Centre Dr Tajul Arifin.